*You will get an corrected involve with the reduced price including german VAT (19%) afterwards. Which means you play not 59€ incl. 19% but only 49 including 19% VAT. Shipping is free. Nice? Yay! This Deal will last only for a given number of Devices. After that we will still still offer a 10% Discount when paid with TELOS. Remember! Please use our converter, and not the value as shown on Exchanges. ￼￼The TELOS PiggyBank is a preconfigured Orange Pi lite with "PiggyBank-OS / original german mining os: PeerschweinchenOS". The Oronage Pi can be operated via a USB port that can supply at least 2.0A. Iphone charging cable or Multi USB charger with at least 2.4A or more at the port are preferable. Via Y-USB cable (not in scope) you can operate the device via 2 USB ports of another device, e.g. TV. However, the device should run 24 hours continuously to achieve maximum yields. Bitcoins can nowadays only be generated with special devices, so-called ASICs. This process requires an extreme amount of energy and yields are dwindling as the difficulty progresses faster than technical progress. As an alternative to the power-hungry Proof of Work concept of the original Bitcoin, an energy-saving variant of the PoS, Proof of Stake, has been developed. Because ARM single-board computers such as mobile phones are very economical, they have low performance but high efficiency in terms of power consumption. Additionally, the Staking uses only a fraction of the CPU time... you can say the device is bored. After switching on, you will find the Transcendence program icon on your desktop. Double-clicking starts the wallet and generates a receiving address for you. You can add wide addresses, all of which are merged into one wallet. Tell us your Wallet address and you will receive 1005 Telos as a thank you/Chashbak. As long as the pi is on, you will regularly receive 20 telos depending on the network size. These can be exchanged on an exchange like graviex.com. With each additional telos, your weighting and thus the frequency of payouts increases in your direction. Your digital piggy bank fills itself. The more TELOS are on the wallet, the greater the chance of being rewarded in each block round. So you could just buy some from graviex and give your wallet a boost. Mouse, USB power source (port with at least 2A), HDMI cable, a local Wifi network . Please make a backup of your wallet to USB stick* after you have received the 1005 TELOS. This way you will not lose your saved after a damage to the device. 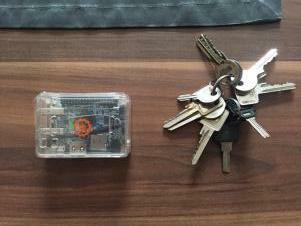 You can also export your private key and put it printed in a safe. Safety first!